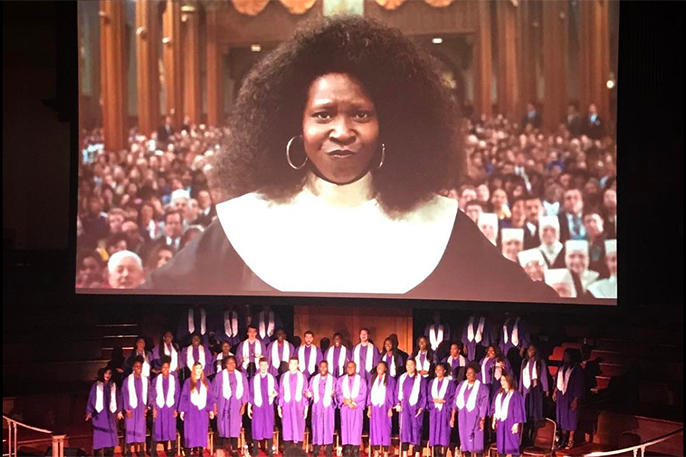 Sister Act, the classic 1992 musical comedy starring Whoopi Goldberg, is the latest film to receive the ‘live cinema’ treatment with the ‘Sister Act Live Choir’, UK Tour presented by Amacoast Cinema. Film fans have been clamouring for pop-ups and live cinema experiences in recent years, as audiences look for new, innovative ways to enjoy the films they know and films that will turn into instant classics. Sister Act fans from across the UK will be immersed in a fresh new cinematic, musical experience, 25 years on after the film was first released. Sister Act Live Choir will boast a choir made up of 35 gospel singers and full band, as they accompany the onscreen nuns with live performances of songs from the film soundtrack. “We are delighted to be touring this powerful and uplifting live cinema experience” says founder, Dele Aro. The show has had two successful, sold out runs in London in Autumn 2016 and April 2017. Dele added“We were delighted to see the shows connect such a large diverse group of people together, to share a unique experience and create new memories around a much-loved film”. Sister Act Live Choir will be an experience which unites and electrifies the audience while bringing a classic to life across the UK!